Home » Greenroom » Spa Products That Smell So Good – Makes You Want to Eat Them! Spa Products That Smell So Good – Makes You Want to Eat Them! It is fascinating when we feel good inside and out. Self-pampering is a reward we can give ourselves after a long day of work, exercise and/or any activity that drains our energy. 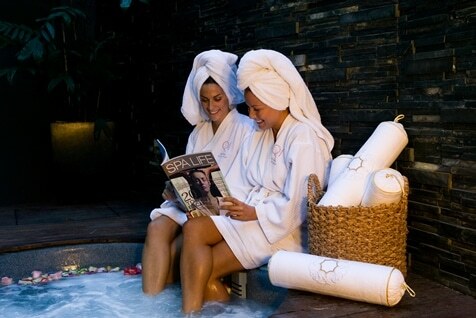 Thinking about spending an hour in a spa is really wonderful – this is what Q1 Spa is all about. Alsco is pleased to share with you the beautiful moments you can get when spending your time at Q1 Spa so as learn how they come up with such a wonderful business. They’ve been using Alsco’s Day Spa Linen for 5 happy years. 1. How did Q1 SPA come to life? We have been there since the very beginning – at the design stage. We sat with Sunland’s architects & worked with them, advising how this spa should be designed. We were part of the build, the FF&E & all that goes with such a project. Prior to our appointment, we were up against some stiff competition, including multi-national spa brand names. However, Soheil Abedian, Sunland’s Founder chose us. We advised him that we would make Q1 Spa the number 1 Spa on the Gold Coast. So he knew he’d made the right decision. We did make Q1 Spa No 1 Spa winning many accolades over the years not the least – Voted in the Top 10 Spas, Australasia, South Pacific by Conde’ Nast Traveller UK. 2. Who is the best customer you ever had? Every customer that walks through our door is the best customer we have ever had. 3. How do you make things lighter or hassle-free when you manage? Be organised, be professional, set boundaries. Be kind, thoughtful & considerate. Have empathy for your personnel as well as clients & then mix all that with a sense of humour. 4. What do you love most about Q1 Spa? And why? Q1 Spa’s iconic reputation has endured all these past 10 years. We have clients who have supported us all this time. However, more importantly, we have spa personnel who have been at the Q1 Spa – some for up to 8 plus years. Don’t you just love that! We had a gorgeous International client once who could not fully understand English. When asked to ‘try’ some of the spa products – meaning ‘try’ on your skin, we came back to find her eating them. Yes, eating them! Mind you some of our products smell so good you could not blame her for having a taste. 6. What’s the best learning experience that you’d like to share with others? 7. What green, sustainable practices do you do in your workplaces? All aspects of our day to day operation are based upon ‘sustainable practices’. Everything is weighed, measured & counted. Apart from winning international acclaim & placing ourselves on the world stage. Q1 Spa became the catalyst for our business to expand into Spa Consultancy. This division of the business gave us ‘wings’. We have consulted at all levels, both nationally & internationally to resorts, hotel groups/chains, architects & destination & day spa developers. 9. How does Alsco help Exclusive Spas? Alsco is an integral part of the ongoing success of the Q1 Spa. We must present at the highest level in all aspects of our operation. Alsco provides us with the spa specific linen & service that is 5 star. Their attention to detail of our requirements is what makes the association mutually beneficial. Early Christmas Presents To Greenroom Readers! Hey everyone – all ears! The famous Q1 Spa Treatment will be giving $50 off for any spa treatment of a 1 hour or more duration. Just mention the code word ‘ALSCO’ when you make your bookings. This offer is valid from October till December 24, 2015. What are you waiting for? Experience the wonders of relaxation for an hour or more! Alsco would like to thank Carol Fleming, owner/operator of Q1 Spa for sharing their story and achievements. After a long day of work, it will be a good idea when you think about going to a spa and pamper yourself. All the stress you get from work or just some activities will surely melt away when you lie down and have some massage, smell the relaxing aroma of the spa room and the soothing music. Alsco does not only promote safety but also relaxation and beauty. Get to know more of Alsco’s Day Spa Linen and experience the awesome service you can give to all your customers. Call us now for more information – 1300 659 892!